The Bandhavgarh Fort, atop the Bandhavgarh hill, located in the center of the Bandhavgarh National Park was the seat of the local rulers till they shifted to Rewa in 1617 A.D. The moving of the capital to Rewa led to Bandhavgarh becoming slowly deserted until the forest overran the area, and it became the royal hunting reserve. While this helped to preserve the forests and its native indian wildlife, each of the maharajas set out to kill 109 tigers as this was considered to be auspicious. Maharaja Venkat Raman Singh shot 111 tigers by 1914. In 1947 when India gained its independence, Rewa State was merged with Madhya Pradesh, and Bandhavgarh came under the regulations of Madhya Pradesh. 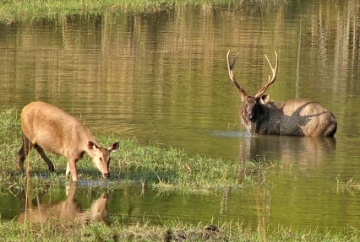 The Maharaja still retained the hunting rights. No special conservation measures were taken, and the process of degradation of the forests and their resident species of indian wildlife, accelerated due to lax control. Maharaja Martand Singh of Rewa was deeply moved by the destruction of the forests due to lax control. 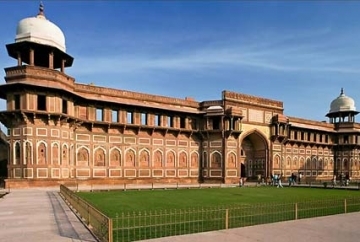 On his proposal an area of 105 sq km was first declared a National Park in 1968. After the park was formed, poaching was brought under control. Grazing by local cattle was stopped, and small dams and water holes were built. 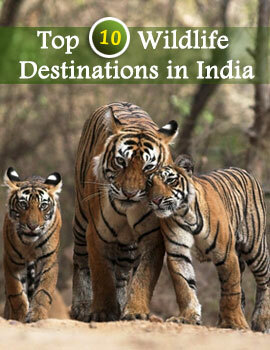 The result was that the indian wildlife population dramatically increased. Tiger numbers started also increasing. To accommodate this rising numbers of tigers and other species of indian wildlife, the area of the park was increased in 1982 to 448 sq km. 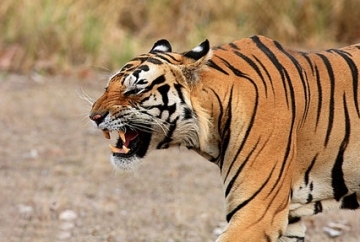 As Project Tiger extended its area of influence, Bandhavgarh was included in 1993, and the area was further extended to include a core area of 694 sq kms , and a buffer area of 437 sq kms. 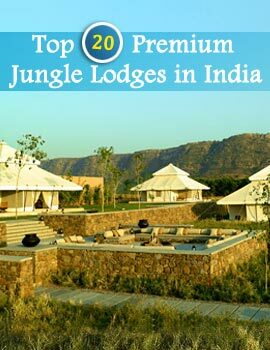 The whole of this area was now declared as the Bandhavgarh Tiger Reserve. 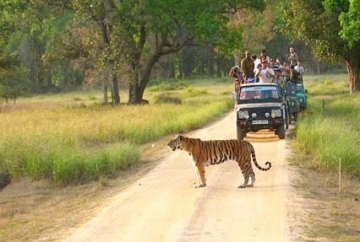 km tourist zone had 22 Tigers leading to a density of one tiger for every 4.77 sq km. 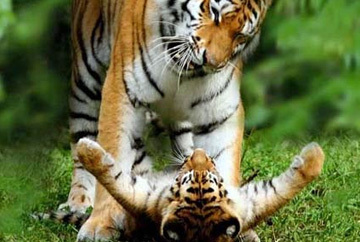 One major reason for the good density is the high survival rate of the tiger cubs in Bandhavgarh. The caves located in the park, which earlier housed humans, now serve as a nursery for the cubs of tigers. These caves protect and shelter them at a time when they are most vulnerable. 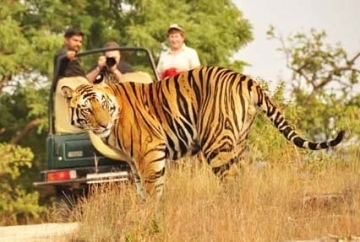 The result is that there is a saying in Bandhavgarh National Park - " In any other Park you are lucky if you see a tiger. In Bandhavgarh you are unlucky if you don't see one."